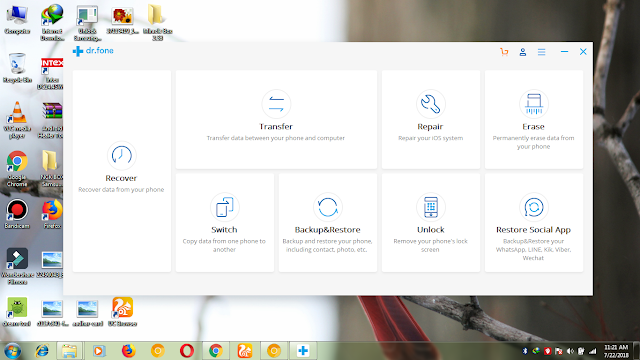 Dr fone toolkit is a small application for windows computer which allows you to recover the deleted photos, videos , contact, messages, call logs and more. It allows you to recover the deleted data from the android smartphone and tablets, whether the data was manually deleted, deleted due the system failure, due to the forgotten password, due to the memory card failure, due to the reboot failure, due to the custom rom flashing, file got damaged, file not opening and device got the black screen. It provides three methods to recover the deleted data i.e internal memory method, broken device method, sd card recovery method. with the dr fone you will get guarantee to recover the lost data in no time. Dr fone also come with various other features including transfer of data from one device to other, Repair the ios smartphone and tablets, permanently removing the data from any device, copy data from old phone to new, create a backup of your data and restore it on your phone including the app data, Android Lock Removal , Android Screen Removal, rooting the android device.